Powerful de-odouriser helps eliminate smells! Can be used for spraying into the atmosphere to dispose of offensive odours, for washing down surfaces and for direct application to odour producing surfaces. De-Odour has grease-cutting and detergent properties which assist its deodorant action. Dilute one part of de-odour with between 100 and 1000 oarts water. i.e. 1ml-10ml product to 1 litre of water. Select the exact dilution most effective against the malodours to be controlled. 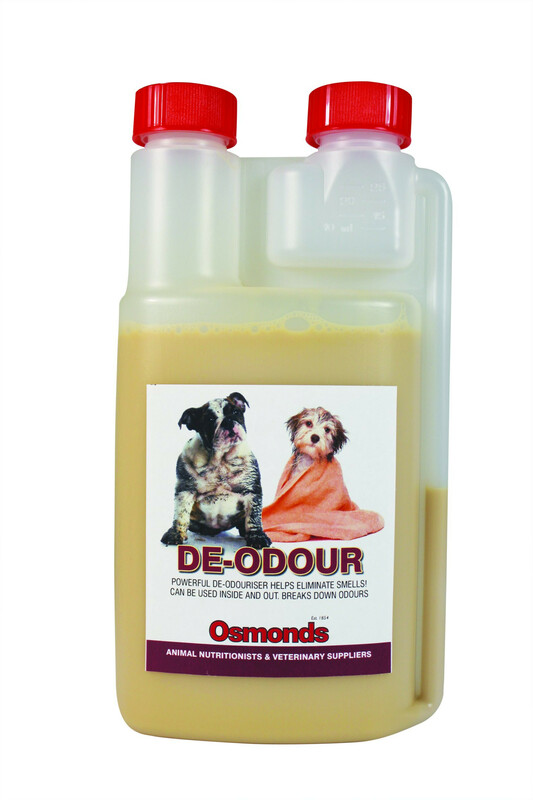 For washing dog blankets / bedding, pour 10oml de-odour into the washing machine softener drawer. De-Odour is fully biodegradable and at use dilution may be considered non-hazardous for all human, animal and vegetable life.